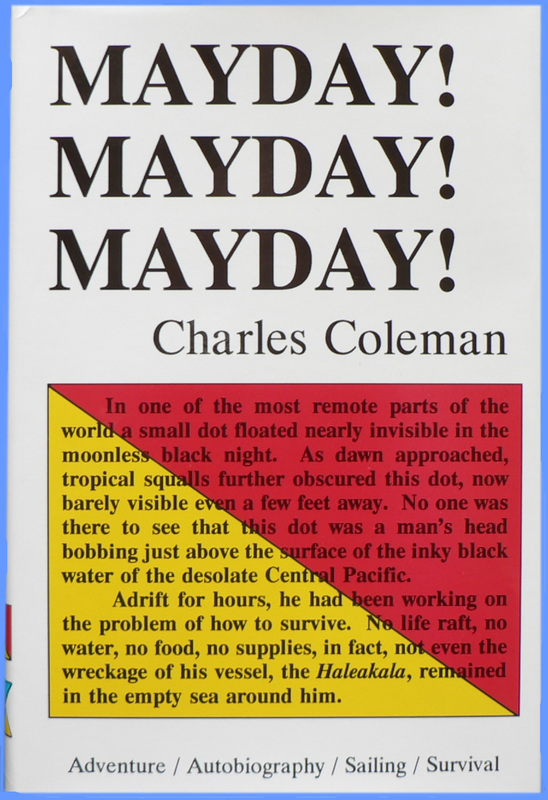 Mayday Mayday Mayday by Charles Coleman - a true story of being lost at sea. In one of the most remote parts of the world a small dot floated nearly invisible in the moonless black night. As dawn approached, tropical squalls further obscured this dot, now barely visible even a few feet away. No one was there to see that this dot was a man's head bobbing just above the surface of the inky black water of the desolate Central Pacific. Adrift for hours, he had been working on the problem of how to survive. No life raft, no water, no food, no supplies, in fact not even the wreckage of his vessel, the Haleakala, remained in the empty sea around him. Totally alone, as few people have been alone, stranded in the middle of the ocean hundreds of miles from islands and people, well over 1000 miles from the nearest rescue center, he floated awaiting sunrise, knowing this was most likely his last dawn. Charley never recognized the word "impossible". Although shipwrecked and adrift, he accepted the challenge to survive as the greatest and most crucial test of his life. 256 pages 9¼" x 6¼"